Promotions will allow you to create promotional codes to distribute to members, customers or suppliers. These codes will apply a dollar discount to an order and can be applicable to any product or limited to a specific one. 2. Select Promotions from the expanded left menu. Code Option - whether the Code will be generic, used by all, or unique and set up a series of codes. Excluded Products - A list of all Product Categories and Products will be listed, you have the ability to exclude any products that you do not wish to apply the discount to. If no products are selected to be excluded, the promotion will apply to all products. Date Range - Control the time-frame for which the promotional code can be used for. 4. 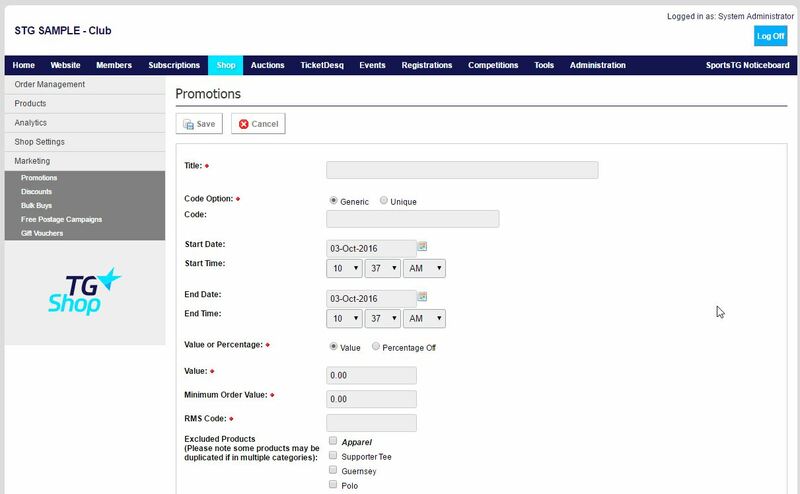 Once you have completed all relevant details for the promotion, click Save. Note: When setting up Promotions you are able to set these to be used on all products, or only on specific products. Use these to offer members or customers a discount on a specific product in your Shop store.